Once you have registered to BitMex and started to get around the platform, you can quickly realize they offer a lot of different order types. In order to get the maximum out of your trading strategy, you must familiarize yourself with the different types of orders you can do on BitMex, how you can set them up and when do you need them. Here is an overview of the various orders you can make at BitMex. What does order type mean? First of all, before moving into the details you need to understand what order types are used for. An order in the business world is by definition a request from one party to another party to act under previously defined, specific terms and conditions. This action can be buying, selling, delivering or receiving financial assets on the markets. Order are legally binding contracts, so once they are set all parties have to act accordingly. 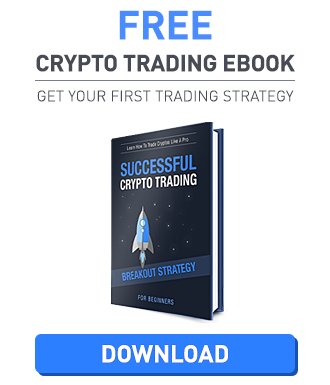 The majority of the order types on the traditional stock, options, and forex markets are very much the same compared to the cryptocurrency trading markets. There are a couple of order types, like market and limit orders which are commonly used in the industry and you can use them almost everywhere. While at the same time BitMex offers some unique order types which is specifically available on only some rare platforms. Whether it is a general order or a very complex one, you should make every effort to understand how it works before engaging any trading activity. Missing key points like how and when the deal is closed or when payments needs to be made can results in serious financial losses that could have been avoided with a bit of extra effort: learning. Visit Bitmex through this link and get a 10% discount on their fees for the next 6 months! BitMex offers several different order types that you can combine if multiple ways on the platform. These can be divided into basic and advanced order types based on their complexity. The point of having so many different types of order is to assist the trader’s own specific trading, hedging and execution strategies. Bear in mind that the different order types have different fees, so examine the fee structure before entering into a deal. Basic order types instruct BitMex to execute deals at a previously determined price. In case of placing a market order, the order is executed immediately at the current price level, which is the best available price. If there is enough liquidity in the order book, the order is executed right away. Market order is one of the most basic order type, the only input variable it has is the quantity, so you only need to set the amount of Bitcoin to buy or sell. The biggest advantage of market orders that they are guaranteed to get filled. Most often the are used in emergency situations, when you want to get in or get out of a trade at all costs. Market orders however do not guarantee the price, the orders are executed near at the bid or ask prices. The last traded price is not always the price for execution, on markets with high volatility – like in the case of cryptocurrencies and Bitcoin – the execution price can be different. 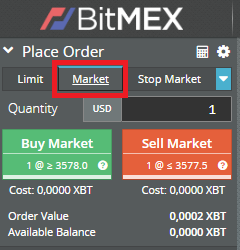 Go to place order section in BitMex and select Market order. Enter the quantity (the amount of Bitcoin) you would like the order to be executed for. The last traded bid (buy) and ask (sell) prices are visible on the Buy or Sell buttons – click on one to place the order. Your order is executed immediately if there is enough liquidity on the market. Review your order and confirm it in the next pop-up screen. With a limit order you can specifically set the maximum and minimum price you are willing to buy or sell Bitcoin. This way you can specify the price or better you want to engage into a transaction. Limit order has two inputs: the quantity (the amount of Bitcoin you want to buy or sell) and the limit price (the absolute maximum or minimum price you allow the system to execute your order). While with limit order you can minimize costs it is possible the order will never get executed if the limit price is so off the current price level. 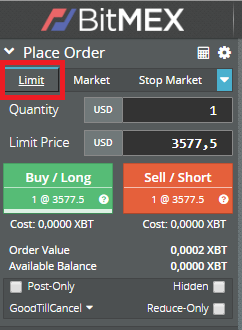 On the BitMex Place Order trading box, select Limit Order from the available order types. Set the amount of contract you want to be executed (quantity) at the specified price (limit price) you are willing to pay or get. To place an order, click on Buy or Sell. Buy limit order is executed at the limit price or lower – so it guarantees you can buy at this price or cheaper. Alternatively, the sell limit order is executed at the limit price or higher – so you will sell at this price or higher. 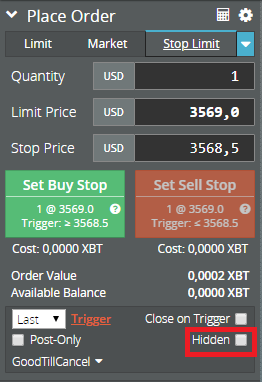 Stop order, or commonly referred as stop-loss is an order through which you can instruct BitMex to buy or sell Bitcoin once the price reaches a specific price level, the stop price. When the stop price is reached on the market, the stop order becomes eventually a market or limit order. Stop orders can be used as an effective risk management tool to limit the losses. They are also often used in automated trading as it offers the functionality to enter the market at a given price level without any manual intervention to place a market order. As stop orders are only executed once the prices reach a certain defined trigger price they can be also used to test developing trends. For a buy stop order the stop price is above the current market price, while for a sell stop order it is placed below the market prices to prevent further loss or protect the profit of an existing short or long trade. Stop Market Order – a market order is entered into the order book once the market reaches the stop price. Trailing Stop Order – a market order is entered into the order book once the market moved as much as the trail value. This is similar to stop market order, but the trigger price is not a set price, but a value differential. A positive trail value will be a trailing buy, and the negative trail value will become a trailing sell. You can also tick Close on Trigger which will convert your order into a high priority order. 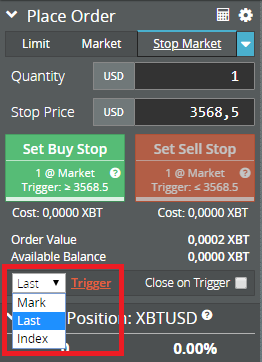 This means that if there is not enough margin on the account to be executed, BitMex will change or cancel other open order in the same symbol to have this order executed. This is often used in case of market reversals to reduce the position or cancel it if otherwise, it would increase. Select Stop Market, Stop Limit or Trailing Stop from the blue drop down. Enter the required quantity (the amount of Bitcoin you want to trade with) and the stop (or trigger price). Depending on what order type you chose, you can also add the Limit price and or the Trail value. Select the type of trigger price you would like to choose. From the drop down you can select Last, Mark or Index prices. To place the order click on Set Buy Stop or Set Sell Stop. Triggered: the trigger price has been reached but no order has been placed. This can happen in case of a stop limit order for example if the limit price is too out of the market. Filled: the trigger price has been reached and an order has been placed. You may cancel stop orders until they have not been filled. Take profit orders are very similar to stop orders but they are executed when the price moves in a favorable direction. Traders usually use take profit orders to set a target price on an existing position to close it and take the profit. Take Profit Limit Order – a limit order is placed once the market prices reached the trigger price. 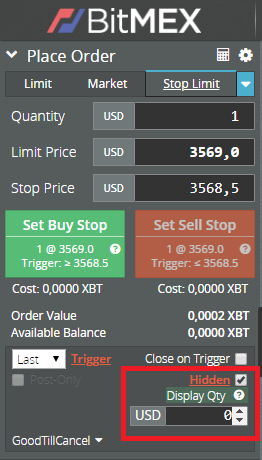 Everything else works the same way in case of a stop order, you can select the type of trigger price and if you want the order to be closed on trigger. 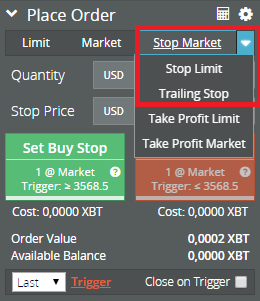 The statuses and cancel options of the take profit order are also the same as for the stop orders. Select Take Profit Limit or Take Profit Market from the blue drop down. 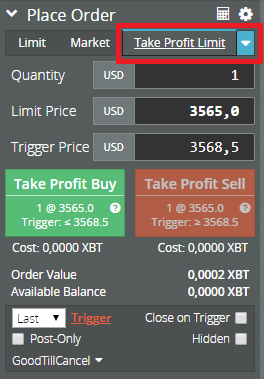 Enter the required quantity (the amount of Bitcoin you want to trade with) and the trigger price. Depending on what order type you chose, you can also add the Limit price. To place the order click on Take Profit Buy or Take Profit Sell. BitMex offers advanced order types for more experienced traders. These complex order types are designed in order to tailor trading strategies and to be able to execute investing decisions in an easy and automated way. The advanced order functions can be combined with basic orders discussed above. Hidden orders are not visible in the order book. Traders often use hidden orders to avoid being exposed on the market if they do not want to inform the market of their trading strategy. This is especially useful for large scale orders. Please note, in case of a hidden order you always pay the taker fee. This functionality applicable for any kind of limit orders. 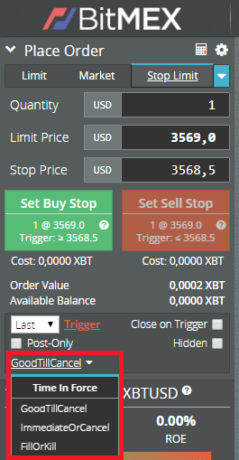 You can select this option for the basic limit order, for stop limit and for take profit limit order with ticking ‘Hidden’ on the place order screen. Iceberg order is a type of hidden order. In this case not the complete order is hidden from the orderbook, only a part of it – like in case of an iceberg, you can only see the top of the iceberg above the water, but it has more below the surface. Just like in the case of hidden order, this is available for limit orders only. On the place orders screen select hidden order and add the amount of contract (the quantity) to be displayed in the order book. If you select zero it will be completely be hidden from the order book and become a hidden order. In terms of fees, for an iceberg order, you pay the taker fee until the hidden quantity is completely executed,. Then it becomes a normal order and they will receive the maker fee for the non-hidden amount. Post only orders are applicable for limit order types as well. They do not take liquidity so they are considered in terms of fees. Post only orders are not executed immediately against the market to ensure a Maker Rebate is applied. If due to the limit price set the order would be executed this function cancels it. Check the ‘Post Only’ function in the Place Order trading box for any limit order you want to place. With the Time in Force functions can adjust when you would like to cancel an order. You can set this for limit order types. Good Till Cancel: This is the default setup for any orders. In this case, your order will be live until you specifically click on cancel. Immediate or Cancel: If you select this option, if after you place an order any unfilled portion left it will be canceled right away. Fill or Kill: The order is only executed if the full quantity can be immediately filled, otherwise it will cancel. If post only order is selected you cannot change the time in force option it automatically defaults to Good Till Cancel.